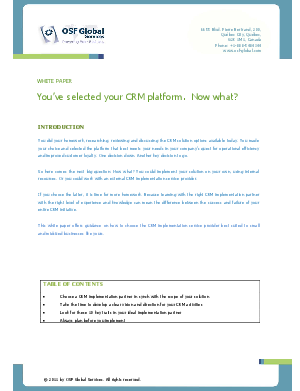 You made your choice and selected the CRM platform that best meets your needs in your company's quest for operational efficiency and improved customer loyalty. Now what? You could implement the solution on your own, using internal resources. Or you could work with an external CRM implementation service provider. If you choose the latter, it is time for some homework. Because teaming with the right CRM implementation partner with the right level of experience and knowledge can mean the difference between the success and failure of your entire CRM initiative. This white paper offers guidance on how to choose the CRM implementation service provider best suited to small and midsized businesses like yours.